Does Your Fraternity Need a Turnaround? Does your fraternity or sorority need a turnaround? Are you stuck in mediocrity, or worse, regressing backwards as an organization? To use a sports analogy, are you in a slump? Mired in a losing streak? Well, if your organization needs a turnaround, sports is a good place to look for examples. Let’s explore lessons from three big turnaround moments in sports, and the men who were the catalysts. 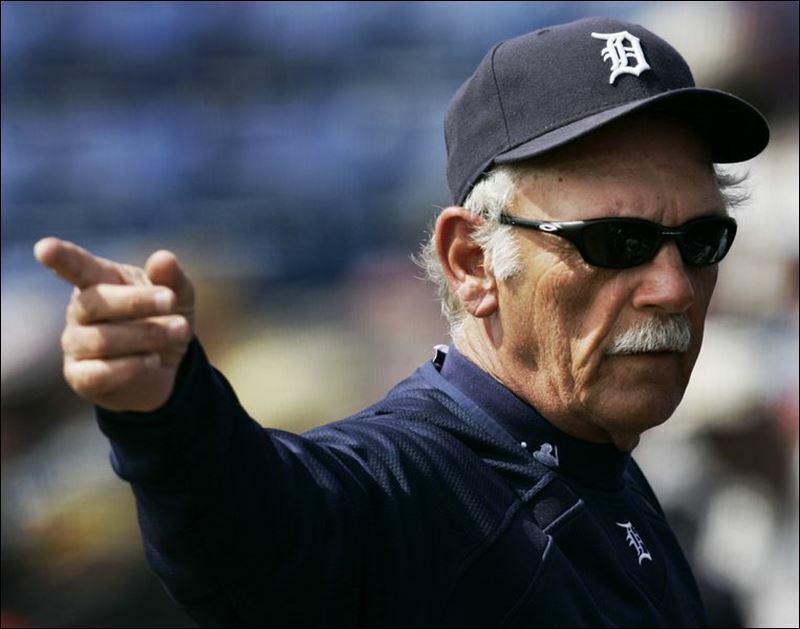 Jim Leyland recently stepped down as the manager of the Detroit Tigers. Leyland was a successful manager, but was probably known more for his colorful personality. He is famous for his arguments with umpires, his no-nonsense communication style, and for doing things like sitting for newspaper interviews in his underwear while smoking a pack of cigarettes. What I remember Leyland most for is a locker room speech that changed the fortunes of the franchise almost overnight. When he took over as manager, the Tigers were one of the worst teams in baseball. They were only a few years removed from nearly breaking the record for the most losses in one season. When Leyland took over in 2006, expectations were higher, but nobody thought he could bring about immediate success. Fans (like me) were still skeptical. However, things looked very promising as the team started out with a 5-0 record. Maybe a reversal of fortune was underway? And then the team lost 4 in a row, and started looking like the old Tigers. The same pattern was emerging. There was a feeling among fans that we were right back where we started. Leyland decided he couldn’t stand for that. Leyland: We Stunk. Next question. Reporter: What bothered you the most? Leyland: It was lackluster, the whole ball of wax was lackluster. We had a chance to take the series, take 3 out of 4, and we came out like we brought our luggage to the park like we had to play a game before we went on the road. That’s not good enough. Leyland: Yeah we stunk period. We stunk and that’s not good enough. This stuff has been going on here before and it’s not going to happen here. We had a chance to take a series. I’m not talking about anyone in particular. I’m talking about the team, myself, the coaches, and everybody else included. It’s my responsibility to have the team ready to play today, and they weren’t ready to play. They were ready to get on the plane and go to Oakland. If they won it was okay and if they lost it was okay. That’s not good enough. Detroit went on to win 27 of their next 35 games. And then they went on to win the AL Pennant and reach the World Series. Leyland’s locker room rant is credited with flipping the switch that would then lead to almost a decade of success. Turnaround. "get in here, everyone get in here..look into each other eyes..now! 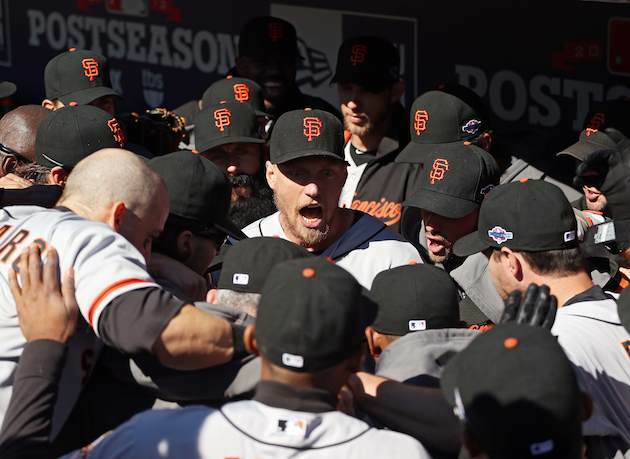 look into each others eyes, I want one more day with you, it's the most fun, the best team I have ever been on said the Reverend Hunter Pence. " and no matter what happens we must not give in, we owe it to each other, play for each other, I need one more day with you guys, I need to see what Theriot (jerry) will wear tomorrow, I want to play defense behind Vogelsong because he's never been to the playoffs..play for each other not yourself, win each moment, win each inning, it's all we have left"............for me an old coach it moved me like I have never been moved before...purity, real, passion, soul. the last of the holdouts this Pence..no arrows being shot, no hey look at me, no spotlight on me, no dance but "play for each other"...honor the game the game honors you..don't know where and when it ends, but tonight I was proud to be together as a team, in a hostile environment, with just us..brothers that play for the name on the front, not the name on the back. The Giants went on to win that night. And win the next 2 games and the series. And the next one. And then the World Series. Pence was credited with the turnaround by his fellow players, who had some fun recreating the speech in the video below. 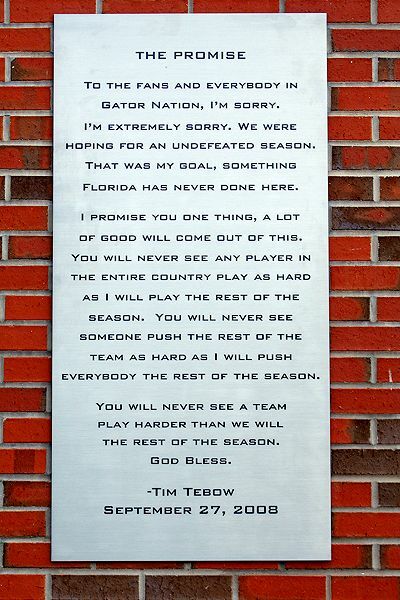 And the final example is Tim Tebow. “promise” was credited with helping to refocus the team on their goal. Without it, the team may not have regained its confidence. Isn’t afraid to display emotional investment. There is also a high level of risk involved. Each of these men stood out there alone and called out for something bigger and better. If their teams didn’t respond, where would that have left them? And it’s worth noting that these individuals likely built up enough credibility as leaders to be able to have these turnaround moments. You may not be ready to challenge your brothers or sisters publicly, but you can start increasing credibility right now. You do that by building relationships. What you’ll find from Leyland, Pence, and Tebow is that while they could command a locker room, they were also regarded as all-around good men, friends, and teammates. Every good turnaround story starts with a moment of consequence and usually, with someone who cares. Is that now? Is that you? I was a (self-proclaimed) master of the mix tape. Whether it was to psych up for a sporting event or competition, or to enjoy a road trip, or to woo a young lady, I knew how to mix it just right. It’s an art form, really. 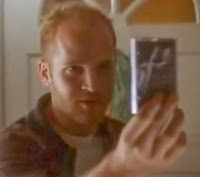 Any person can just throw a bunch of songs onto a cassette. But, that doesn’t make it a mix tape. Mix tapes get their power from thoughtful design, song ordering, and transitions. It’s like writing a book - there is a storyline in a good mix tape. A mix tape is like life. And so is a fraternity experience. So, is it possible to mash-up these two things? Here is my best attempt. A mix tape without a purpose is like an I-Pod Shuffle. There are good songs there, but no thread by which they connect. Similarly, a fraternity can have good guys, but without purpose there is nothing around which to gravitate. To focus. When you build a mix tape, you need to start with the reason why. Are you trying to inspire better athletic performance? Or trying to tell someone how much they mean to you? With that focused purpose, choosing the right songs becomes simpler. Here is an example, if I were building a mix tape with the purpose of evoking the essence of life’s journey, then I might start with a slow and reflective song with a good build-up - maybe like Pearl Jam’s “Release.” I would then search for music that represents the circumstances of life, such as R.E.M’s “Half a World Away” to represent longing, Patsy Cline’s “She’s Got You” to represent love lost, and Mumford and Son’s “I Will Wait” to evoke love found. For your fraternity, what is your reason why? If it’s to live out the teachings of your Ritual (I hope), then you should choose members and initiatives that can help make that happen. If you don't know your purpose, or select members that contradict your purpose, then the end result is disjointed and confusing. The artistry of a mix tape comes from the variance in the songs selected. If one side of your mix is all heavy metal and the other side is all broadway, then you haven’t made a mix tape. You’ve made two compilations instead. Mix tapes can find a way to blend genres like heavy metal with broadway and yet make it sound perfectly right. This is difficult to do, but when you hit it right, it’s special. It's a high risk, high reward endeavor. I once made magic with a combo of Pachelbel 's Canon in D and Chumbawamba's Tubthumper. On the flip side, a blend of Andrea Bocelli and Poison doesn't work as well. In fraternity, variety can be found in many forms. A good fraternity experience will expose members to many different opportunities, including service, education, networking, and leadership. A good fraternity experience should also expose members to different types of people - meaning that your membership should be diverse. We grow the most in life because of the different individuals who come inside our life. There is only so much we can learn from people who have similar life stories to ours. And besides, a mix tape with only the same type of music is boring. As it is with fraternity. watch the reels in motion and pray that the recorded tape would hold out for 30 more seconds. Watching to black tape spool shrink smaller…and smaller...and...KERCHUNK. Stopped. Watch your time. The undergraduate fraternity years - while not the only years through which to experience fraternity - are very special. Before you know it, they will be gone. The opposite of running out of time on a mix tape is leaving too much soundless space at the end. The space is begging to be used. Make sure that you can say you took advantage of every minute you could, and that you left no tape unfilled. If a fraternity experience is done well, there will be plenty of time for laughter, frustration, anger, joy, sadness, inspiration and all other emotions associated with being human. Only those things most vital and significant in life evoke emotions. If your fraternity, or your college experience, or your job, or your marriage, any other major element in your life does not evoke emotions, then something is wrong. We shouldn’t be afraid of endeavors that will make us vulnerable to emotions, and instead, we should search for them. In the same way, a mix tape moves from good to powerful if it can evoke emotions. Songs can send tremendously relevant resonance into our psyche. My favorite mix tapes made me tap my feet at times, made me laugh at times, and made me cry at times. Especially if they included Eva Cassidy. If it’s not obvious by now, I’m old school in a lot of ways, and another indication is how I still like to view music albums as...well...albums. I think an album should be judged on its entirety and not just on the 2-3 songs that will be played at wedding receptions or top 40 countdowns. I admire bands that can build albums into musical experiences rather than just a collection of songs. U2 could do this. Pink Floyd too. I’m not sure who in today’s music is really achieving this, but it’s hard now in the itunes generation. We buy songs more than albums these days. Anyhow, I think a good mix tape mirrors this, and especially knows how to capitalize its beginning and punctuate its end. 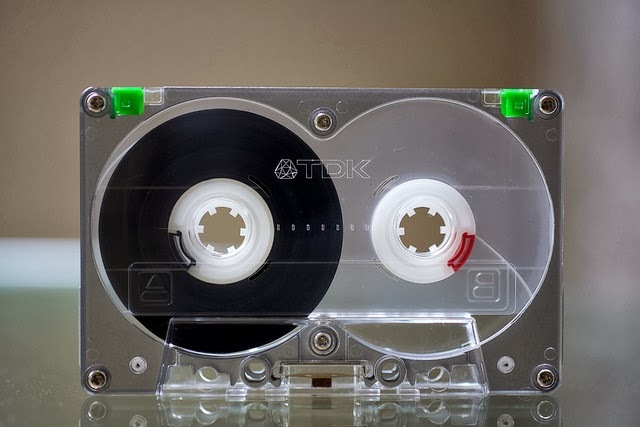 On the mix tapes I enjoyed the most, I would find a creative way to start the tape, usually involving a slower song with a dramatic buildup leading into a fast-paced rocker (old timers, think of Van Halen’s 1984 album). I wanted to set the mood and draw the listener in. Likewise, a good ending is essential for leaving the listener with the thought that they just experienced something big. Garth Brooks was always excellent at closing songs on his albums (think “The Dance” and “The River”). In a fraternity experience, it’s not so hard to start strong. We’re good at that. We know how to make getting bids and initiation ceremonies a big deal. We can launch our members forward with excitement. But, too many of our members end their fraternity mix tape by their Junior year. They start to see less value in the experience, or just turn their attention to something else. 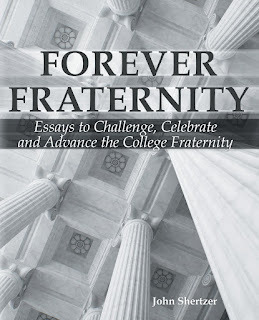 Not only do I encourage fraternities to find relevant ways to engage older undergraduates, but I also encourage those older undergraduates to take it upon themselves to end strong. Your experience is an asset. Think about how you can seize these later days of your undergraduate experience and do things that matter so much to your fraternity, that the newer members have a inspired and lasting impression of you. You become the powerful mix tape that stays in their mind. 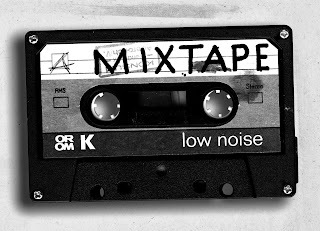 Most of you reading this have probably never made a mix tape, and never will. Yet, you can make a fraternity experience. You choose the message, you choose the music, you choose the time, and choose how it ends. Make it one that you’d never want to stop listening to. And one more thing. I most strongly believe that...KERCHUNK. If you've been reading this blog, you know by now that I believe a little defiance in the fraternity/sorority system should be accepted and appreciated. After all, our organizations were founded to go against the mainstream of the day. We were developed in defiance to the predominant attitude that education should be structured, conformist, controlled, and orderly. Fraternities and sororities sought to add some humanness to stodgy and rigid educational environments in early America. Thus, we shouldn't deny this is a continuing part of our DNA. It can be one of our most beautiful organizational personality traits. While we want our chapters to follow policies that will keep members safe, and we want them to stay committed to ethical decision making, we shouldn't prevent opportunities for the defiant side to emerge every now and then. Who knows what kind of sparks will be created? Maybe that one chapter does have a better way to approach recruitment. Maybe the IFC is right about how to improve the risk management policy. Maybe those sorority members at Alabama actually know better than the alums about who deserves to belong. When we allow a healthy dose of independence to live within our fraternity and sorority systems, then we allow our members to develop their own thinking and their own solutions to problems. Sure enough, some will abuse that responsibility, which only makes campuses and headquarters want to take more control. We just need to understand that because of the circumstances of our founding, control is something fraternities and sororities will always resist. Source: Blanchard, K. (1998). Servant-leadership revisited. In L.C. Spears (Ed. ), Insights on leadership (pp. 21-28). New York, NY: John Wiley and Sons.